Enjoy the great taste of summertime with the good old-fashioned refreshment of Country Time Lemonade. Cool and refreshing--not too tart and not too sweet. 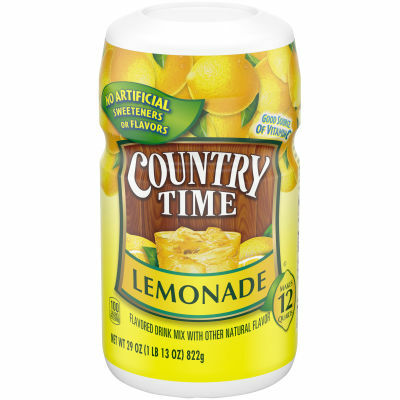 And did you know that Country Time Lemonade has no Artificial Flavors? So go ahead and take time for summer's simple pleasures, mix up a pitcher and enjoy. Country Time is a proud supporter of Alex's Lemonade Stand Foundation. Country Time donates annually to Alex's Lemonade Stand Foundation to support their mission of curing childhood cancer. Serving size 2 Tbsp. (26g) (makes 12 fl oz).